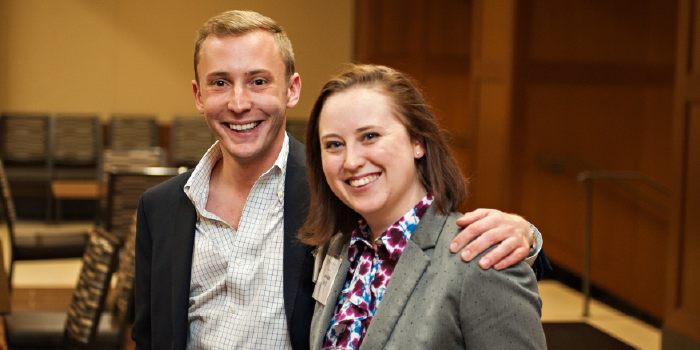 Photo of Chris Salemme (JD '17) and Sarah Saint (JD '17). Chris Salemme (JD ’17) has had the article, “Unpatriotic Profit: How For-Profit Colleges Target Veterans and What the Government Must Do to Stop Them,” published in the Brigham Young University Journal of Public Law. The article ”explores the for-profit education industry, its history of deceitful recruitment of veterans, the federal government’s attempts at reform, and what steps need to be taken by the Trump administration and Congress to protect veterans and taxpayer dollars from private industry exploitation.”The former editor of the Wake Forest Journal of Law and Policy, Salemme is currently serving as the law school’s Veterans Legal Clinic fellow before beginning his active duty service obligation to the Army in the Judge Advocate General’s (JAG) Corps. Salemme was the 2017 recipient of the Smith Anderson Pro Bono Award for Exceptional Service, which is presented annually to a Wake Forest School of Law in recognition of extraordinary pro bono service to the community. He also received the E. McGruder Faris Memorial Award, which is given to the student exhibiting the highest standards of character, leadership and scholarship. A 1st Lieutenant in the United States Army on an educational delay of active duty during law school, Salemme provided more than 100 hours of pro bono service, including 75 hours to the Veterans Advocacy Legal Organization (VALOR). As a law student, he dedicated additional pro bono hours to the Expungement Clinic, Mediation and Know Your Rights Project. Serving those who served is a cause close to Salemme’s heart, and motivated him to join VALOR. “My work with VALOR and the Veterans Clinic has allowed me to reach out to the veteran community, of which North Carolina has one of the largest in the nation, to provide them with the information and resources necessary to fully exercise their rights under the law,” he said in a 2017 interview.